Re: Mars photos with channel between "lakes"
In the new study, the researchers analysed the depressions and discovered a series of small sinuous channels that connected them together. The researchers say these channels could only be formed by running water, and not by ice turning directly into gas. And they liken these 'lakes' to permafrost marshes in Alaska, suggested that water ran from the high point lake to the low point lake. However, the high point lake apparently has a deep end farthest away from where the sinuous rille... I mean- sinuous channel connects. Also, the 'channel' is apparently as deep as the lake is on that side. How do they presume that the water confined itself to that one narrow 'channel' to drain the whole lake? Especially when it appears that the 'deep end' was on the other side of the lake from there?? There's no terrain to confine a drainage stream to a particular path so that it could carve the stream to the depth of the high point lake? Why didn't the lake just exceed it's banks and recede again? This article is just the epitome of wishful thinking and flights of fantasy. I guess the one way that you could tell would be to look at the channel, in closeup, and see if the channel is a V-cut, with a darkened cut along the middle of the channel. Next, look to the sides of the channel, and see if there are berms of equal height on either side. If you're good at estimations and math, you could check to see if the amount of material missing from the channel is indeed held by the berms on either side of the channel. If both of those two criteria are true, I think you have pretty much proven that it was created electrically, and not by any running water. you show an image of a triple crater in a straight line, and there is a reference underneath to the original NASA caption: "[T]hree aligned meteor impact craters on the floor of a much larger crater in the Noachis Terra region. The craters may have formed together from a single event in which the impactor (the meteor) was broken into three pieces." 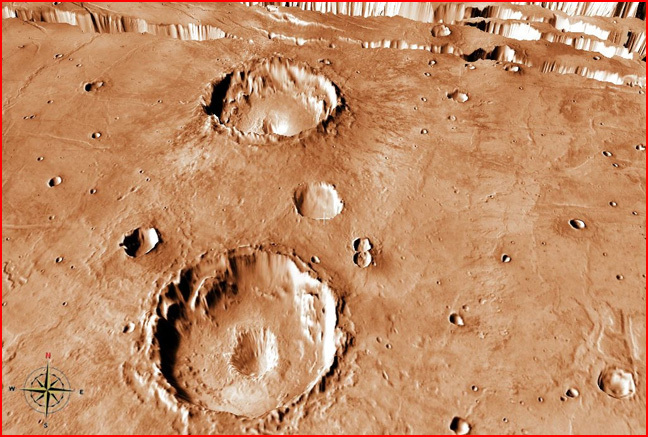 I cannot find that image anywhere in NASA pics that I can find, I have scoured detailed NASA maps and google mars maps of the Noachis Terra region, but I cannot find that triple crater. I am talking about that crater with a geologist in another forum, he has expertise in impacts and I am trying to get him to consider the Electric Universe theory, and he would like to find it in a map try to estimate it's parameters etc. Could someone here give me the Mars co-ordinates of the triple crater? When I did a google image search it only came up with this site.. Ask your geologist friend to consider that there seems to be no ejecta from these "impact" craters. Note the rather flat bottoms, except for the "dune" markings. It pains me to see them thrashing around for a plausible explanation. The probabilities of the occurrence of twin bulls eyes presents a problem for impact theory. Yeah, "impact rebound" just doesn't seem to be happening here, does it? But I still can't quite see how EDM can be invoked for both excavational and depositonal features, ie lichtenberg mlouintains and valley structures, as well as for both central mounds and central dents in craters? Doesn't survive the cut of the razor for me. i thought lichtenberg mountains are the result of an electrical discharge not electrical discharge machining from a plasma arc? from what i can work out some of our craters or the largest flat depression areas found in or beside mountains are discharge craters but caused by the earth discharging and not by another planet doing EDM. examples are tunguska and also the meteorites that hit jupiter. i can believe that those objects had that much energy so they trigger the discharge from the planet. we get craters jupiter gets big holes in its clouds. i guess this has been mentioned elsewhere but i dont remember reading or understanding this from the videos, books and tpods? I *did* post something about electrical discharge machining earlier today, and got their customary "pending review" notice when I hit submit. As of Aug 03, 10:20 PM Central time my post has yet to show up in the comment section. I wonder if it will? I'm not willing to cry foul until at least 24 hours have passed, but I can't help but wonder if it has been flushed. It's there now, Shelgeyr, well done! davesmith_au wrote: It's there now, Shelgeyr, well done! Unfortunately, Shelgeyr's comment is four days after the fact and, judging from the caliber of most of the other comments, I doubt if most visitors/posters bother to read that far down the list. It's likely that the regulars have already moved on to some other item they no nothing about, with which they can hone their banal sophomoric efforts at being clever. Although, if even one reader is enticed to look further into EU theory, then I guess it's worth the effort. Plus, if it causes Phil-the-Shill a bit of discomfort, well, that's a bonus. Thanks, guys! Yeah, I came in at comment #95 - a tad late to the party - but I'm still pleased as punch it showed up at all. Someone must be slipping!